Taste quality with every bite of Dhanraj Atta Flour. Dhanraj Atta Flour elevates everyday meals with rotis that are flavorful and puffed to perfection. Our wholesome blend is ideal for rotis, puris, chapatis, parathas and more. Wheat flour, malted barley flour, niacin, iron, thiamin mononitrate, riboflavin. 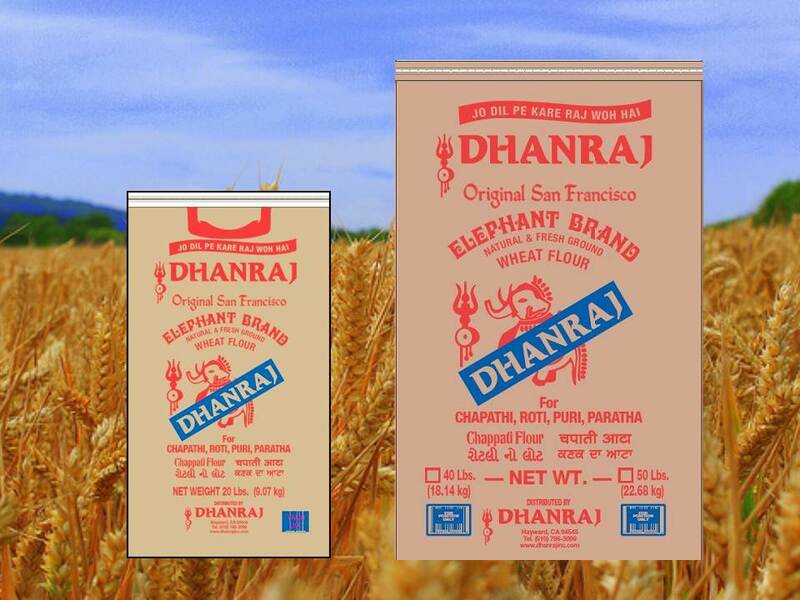 To make roti, chapati, or everyday Indian flatbread, take 2 cups of Dhanraj Elephant Brand Wheat Flour and add around 1 cup of warm water gradually to mix the flour until it comes together. Form the flour into a ball and knead the dough until it is soft. Add a few drops of oil and knead the dough again until it is smooth. Separate and roll the dough into 10 equal sized balls. Take one and flatten it lightly. Dip both sides of it into flour. Using a rolling pin (belan) and board (chakla), roll the ball until it is flat, round and approximately 7 inches in diameter. Make sure the rolling surface is dusted with flour. Keep the remaining dough balls covered in the meantime. Heat a flat griddle (tava) to medium low heat. Place the roti on it. Heat for around 10 seconds and flip to other side. Increase the heat to medium high. Rotate the roti every few seconds to ensure an even cook. Once brown spots appear on the underside of the roti, flip it over. At this point, it will start puffing up. Lightly press down on the roti with a dry towel to help it puff so that it is soft. Remove the roti from the heat. Optional: brush the surface with ghee or butter. Place in a container (roti dabba) lined with cloth or paper towels. Cover the container. Repeat the rolling and cooking process for the remaining dough balls. Serve delicious rotis hot with curry or pickles. *Note: recipe makes approximately 10 rotis. The size and thickness of each roti may vary.